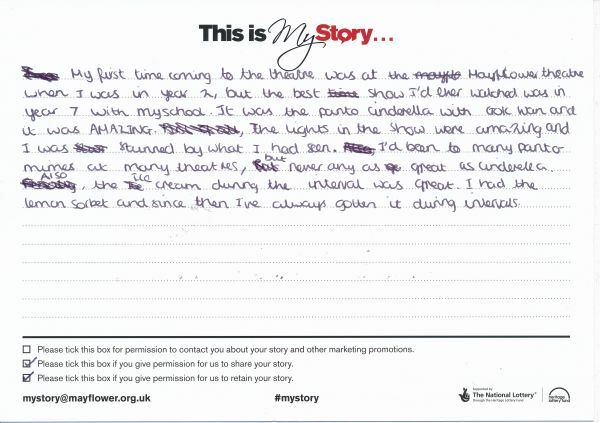 My Story Card: Lina Rahman talks about coming to Mayflower Theatre for the first time with her Year 7 class. My first time coming to the theatre was at Mayflower theatre when I was in year 2, but the best show I'd ever watched was in year 7 with my school. It was the panto Cinderlla with Gok Wan and it was AMAZING. The lights in the show were amazing and I was stunned by what I had seen. I'd been to many pantomimes at many theatres, but never any as great as Cinderella. Also, the ice cream during the interval was great. I had the lemon sorbet and since then I've always gotten it during intervals.